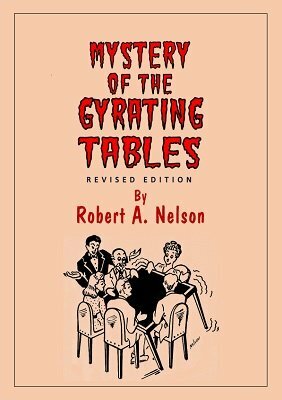 In this eBook, Bob Nelson reveals his Mystery of the Gyrating Tables presentation, complete with opening lecture. This effect certainly belongs in the realm of the psychic. Present it as an example of spirit phenomena, inject a little showmanship, and, as Nelson says, you'll "skyrocket to fame." Using ordinary, unprepared tables and no apparatus whatsoever, the tables will tip, teeter, wobble and gyrate around the room or stage in the craziest fashion. And this despite the medium not even seated at the table with the participants! No stooges or confederates are employed at any time. Four, five, or more persons are placed at a table. Several tables may be tried at the same time. You can create a riot of fun by apparently projecting "spirit power" and giving animation to the tables. This is terrific entertainment and can be presented anywhere. It's easy to learn and present - all the information you need is supplied in this routine. Are you a Nelson collector? This book was listed as No. 107 in the Nelson Enterprises catalog . 1st edition 1944, PDF 17 pages.